Born on 12 January 1863, Swami Vivekananda was an chief disciple of the 19th-century saint Ramakrishna. He was a key figure in the introduction of the Indian philosophies of Vedanta and Yoga to the Western world. He is that he made at the Parliament of the World's Religions in Chicago in 1893 and introduced Hinduism to the World. After returning back to India from Chicago he stayed in a house at Chennai for nine days and hence this house has been called Vivekananda House. 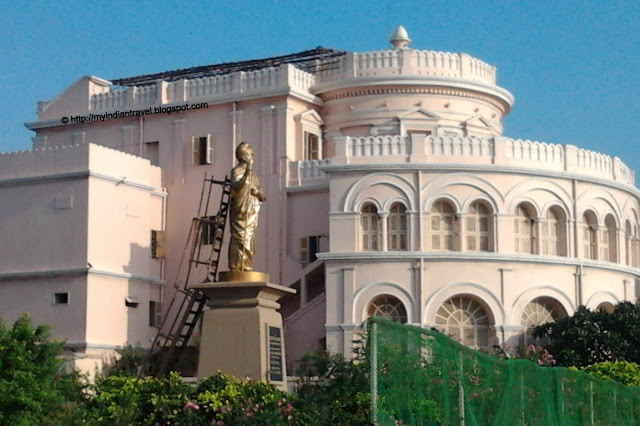 Now, this historic place houses a permanent exhibition on Indian Culture and Swami Vivekananda’s Life. The exhibition is open to public all days from 10.00 AM to 12.15 PM and from 3.00 PM to 7.15 PM except Wednesdays. I could not see the exhibition as I was too early to this place. Lovely photos. All the Indians are his fans. Rally the youth icon. Nice capture on his statue and the house! Such an interesting post. The building is beautiful and the statue is impressive. I know you enjoyed the exhibition. Oh, such beautiful blue, blue skies, Rajesh!! And a magnificent statue!! Great captures for the day, as always!! I hope you and your family have a great weekend! Enjoy!! 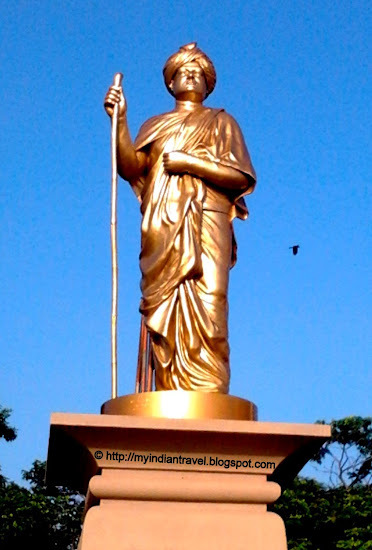 What an impressive golden statue. The exhibition must be interesting. Hope I get a chance to visit. Boa tarde, não consegui a tradução, no entanto digo-lhe que as imagens tem qualidade e são maravilhosas. Jeevan, thanks for the correction. Wow! That is a magnificent statue! What a beautiful building! It's amazing to boast a lovely statue as well! A wonderful post. Loved the pictures. Swami Vivekananda....one of my most favorite personality. Its amazing to see the house. Thanks a lot for sharing.